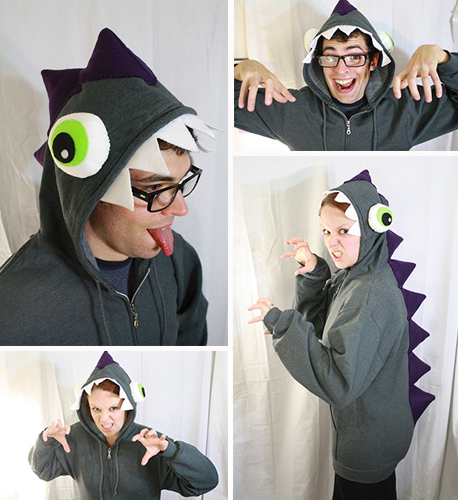 I also made Jeremy a bug-eyed swamp monster/dinosaur hoodie for Halloween last year, because when I offhandendly said something about it, he was all like “Sure, I’d wear something like that.” So then I was all “Really?!? 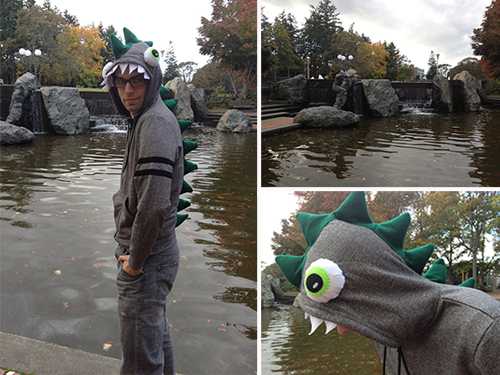 Because I will go make it right now then!” So I made it, and he wore it, and his theatre classmates loved it and we took funny pictures of him in it by the UVic fountain and it was awesome. And then I made some more monsters. 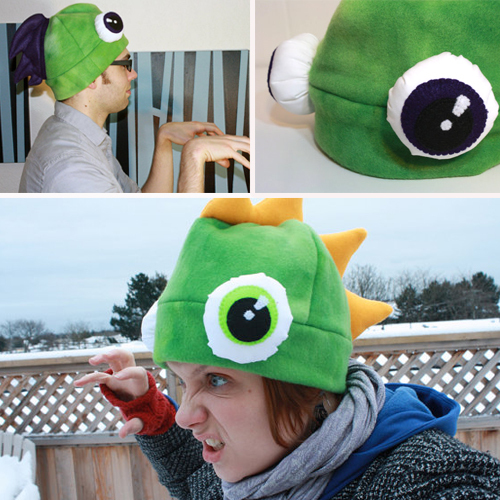 In the form of bug-eyed monster hats. 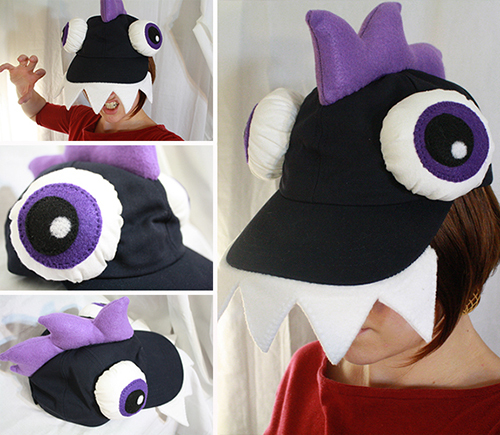 Because I’d discovered that making huge bulging cloth eyes and sewing them onto things satisfied a small but important part of my being. The part that wanted to give everything huge bug eyes. Because they’re funny. They’re so funny I basically started sewing them to everything. Hoodies, baseball caps, I’m thinking of trying them on a headband. One thing I love about making monsters is you can make them look however the heck you want. Feel like making horns? Make horns! Feel like giving them three eyes, 15 jagged teeth and a neckbeard? Do it! Did you screw up that felt nose so it’s kind of crooked? Put it on a monster and you can say it’s crooked on purpose! 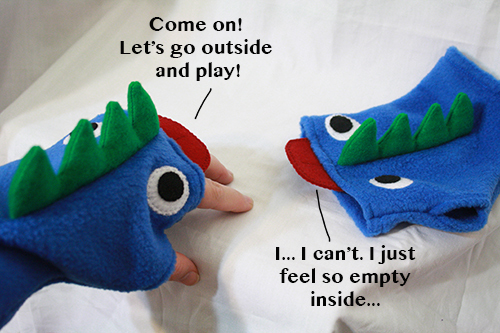 No one can tell you that you’ve made your monster “wrong,” because there’s no such thing with monsters. 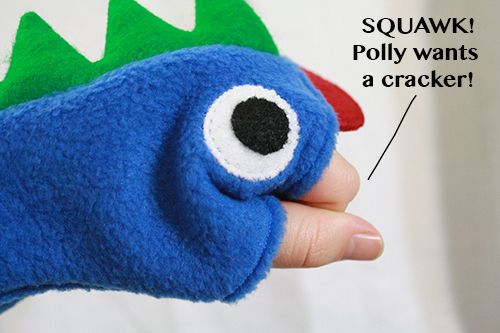 They’re a great thing to make when you want to be creative in a do-whatever-weird-thing-I-feel-like-right-this-second way. Or in a use-up-these-random-and-possibly-mismatched-bits-of-materials way. They’re also pretty cute. Monster-making allows for entirely random creativity it terms of size, shape, colours, materials, appendages and accessories, and everyone comes up with something a little different. 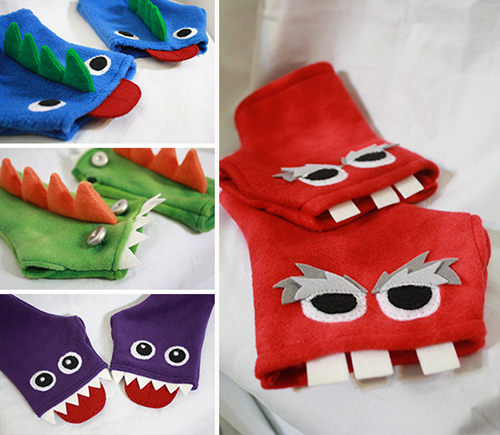 If you check out some of the links and comments on the page corner bookmark monsters tutorial, you’ll see that adults and kids alike have taken that idea and made it their own, coming up with hundreds of different bookmark critters. Many of the delightful and/or derpy fellows I’ve created over the past week are now available in my Etsy store. Go check them out! Adopt one! Really, do – I’m running out of shelf space and some of them are chewing on the corners of the other critters up there. So, what is your favourite thing to make? What (or who) is your favourite monster? 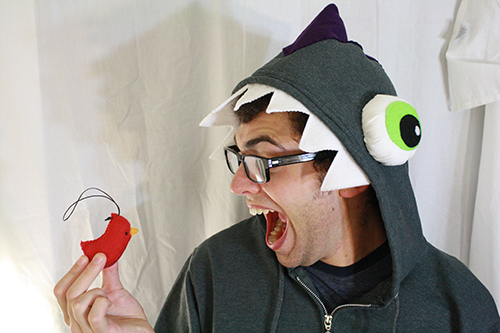 felt pins for PAX... and the PAX crafting panel!